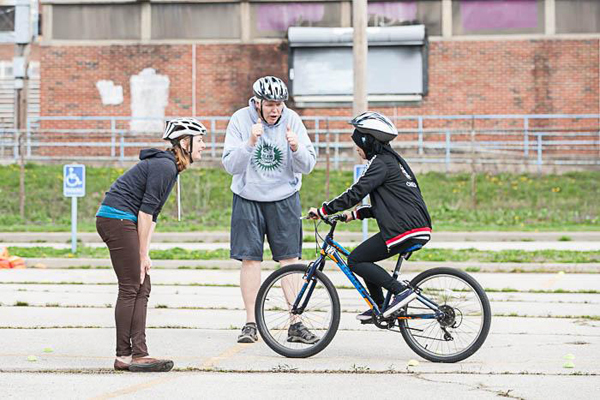 BikeWalkKC Education Outreach Coordinator, Laura, and East teacher, Mr. Patrick Brier, coaching a student on hazard maneuvers. BikeWalkKC Education Manager, Maggie, teaching Noor how to ride a bike. She only ever rode tricycles in Iraq. She was riding two wheels in no time! Someone made a joke about hand signals during the first class of East High School’s bicycle program (March 24th). 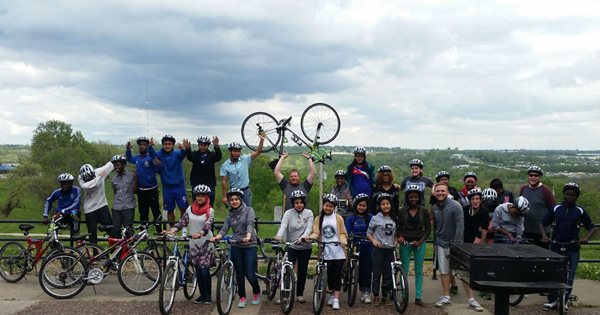 Students conquered the Blue Valley Park Hill on a cloudy bike ride through the park (April 21st). 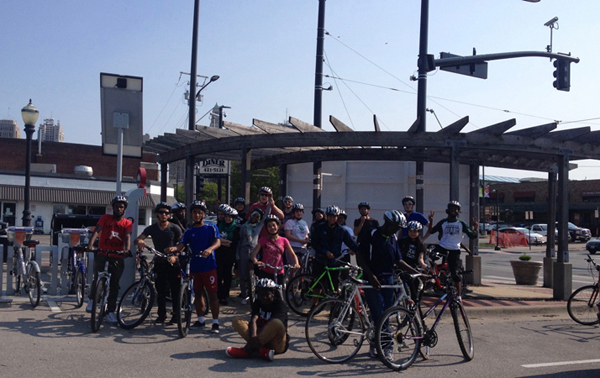 Students enjoying ice cream after riding to 3rd and Grand Street from East High School (May 5th). 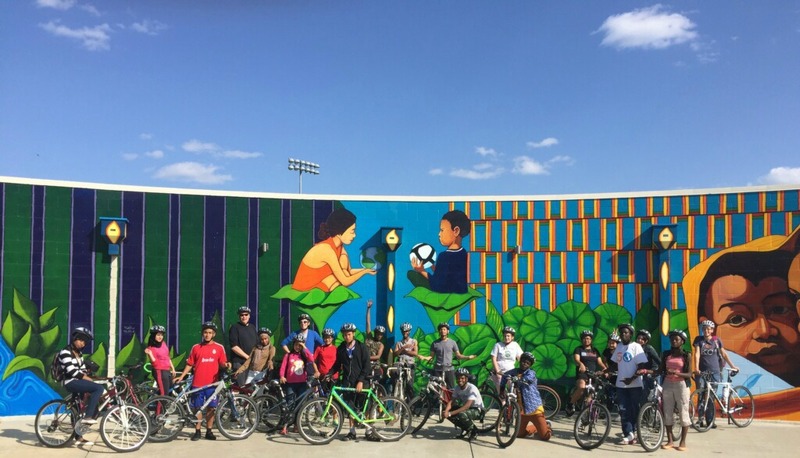 On the final ride, students rode from East to the 9th Street soccer field, where many sporting events take place throughout the year (May 12th). Souleman practiced the hazard maneuver drills with nice dress shoes and slacks, and still beat everyone. He moved to Kansas City from Sudan. 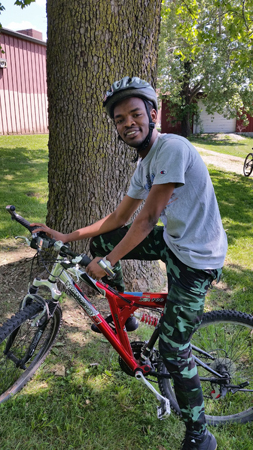 As soon as Souleman received his bike, he rode it to school the next day and locked it on the bike rack with his new lock. 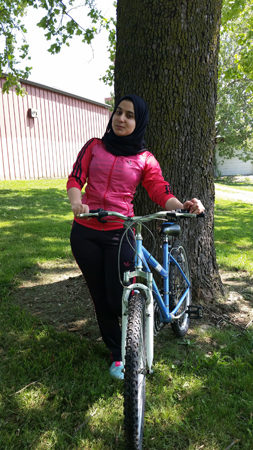 Sabah first learned how to ride a tricycle growing up in Iraq. She was nervous to try two-wheels, but by the end of the program, was riding along with the rest. Her confidence grew immensely! Students tackled all challenges with smiling faces; even 8 percent elevation changes! The program garnered amazing support from other school staff, the principal, neighbors, and friends. It was evident when bicycling around Kansas City’s east side (with all 26 students and 6 adults), that there is an extreme disparity in the presence of bicycle infrastructure (not to mention HILLS). 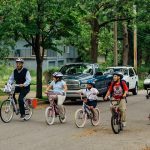 Several of the students expressed that if there was a dedicated or even protected lane, they would be more likely to ride their bikes to school and other activities. 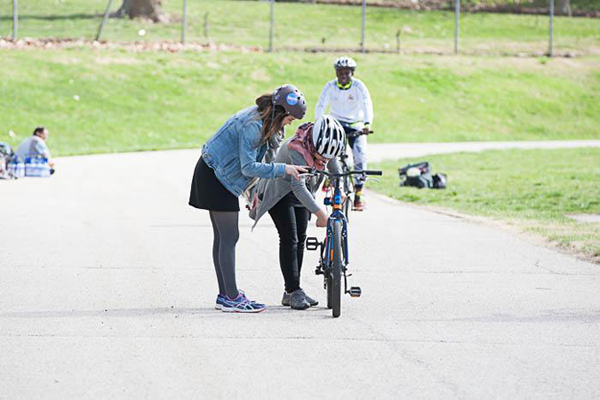 East students hope that, through this program, awareness will grow for the importance of protected and connected bicycle facilities for all areas of Kansas City. 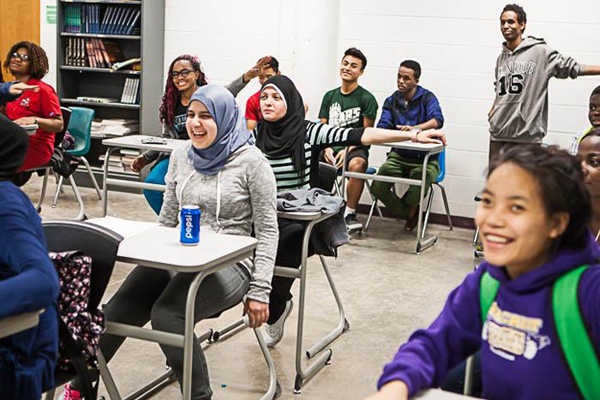 This year will mark the first of many Youth Ambassador cohorts at East High School. 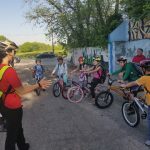 We hope that the enthusiasm for bicycling and active transportation will not only grow within the school culture, but also set a precedent for other high schools in the district and beyond. *Thanks to the super champions at East High School: Andrew Killen, Patrick Brier, Nate Zier and Zach McCullough. And to all who donated! The success of the program wouldn’t be possible without your generous support: Tiffany Siner, Megan Scanlon, Richard Hill, Cynthia Bleck, Rita Killen, Chris & Dan Danford, Sherry Fetzer, Thomas Herrera, Blayne Marshall, Carolyn Hammond, Rhea Muchalla LeGrande, City of Shawnee, Kimberly Jacobs, Linda Brines and Charles White.